76 Marlborough is located on the south side of Marlborough, between Berkeley and Clarendon, with 74 Marlborough to the east and 78 Marlborough to the west. 76 Marlborough was designed and built ca. 1866 by architect and builder Charles K. Kirby, for speculative sale, one of five contiguous houses (72-74-76-78-80 Marlborough) he built at the same time for speculative sale. The five houses form a symmetrical composition, with 72-74 Marlborough and 78-80 Marlborough each being a pair of symmetrical houses with bays, and 76 Marlborough with a flat façade in the center. Click here for an index to the deeds for 76 Marlborough. On November 1, 1866, 76 Marlborough was purchased by Mary (Vinton) Clark, the wife of Randolph Marshall Clark, treasurer of the Boston Elastic Fabric Company. They previously had lived at 12 Pemberton Square. They also maintained a home in Pomfret, Connecticut. They continued to live at 76 Marlborough until his death in September of 1873. Mary Clark moved to Pomfret, but continued to own the house and lease it to others (by the early 1880s, she had resumed spending the winter season in Boston, and lived at 336 Beacon during the 1881-1882 season). By 1875, 76 Marlborough was the home of attorney and mining investor Horatio Ripley Bigelow and his wife Anne Lenthal (Smith) Bigelow. Their unmarried sons, Albert Smith Bigelow and Joseph Smith Bigelow, also mining investors, lived with them. They also maintained a home in Hanover. Albert Bigelow married in November of 1875 to Mary DeFord and they moved to 10 Gloucester. Horatio and Anne Bigelow and Joseph Bigelow continued to live at 76 Marlborough in 1876, but had moved to 57 Marlborough by 1877. By 1877, 76 Marlborough was the home of Malcolm Scollay Greenough and his wife, Lizzie (Tiffany) Greenough. They previously had lived at the Hotel Pelham (southwest corner of Boylston and Tremont). Malcolm Greenough was general assistant to the agent and treasurer of the Boston Gas Light Company, and later would become president of the Cleveland Gas Light and Coke Company. 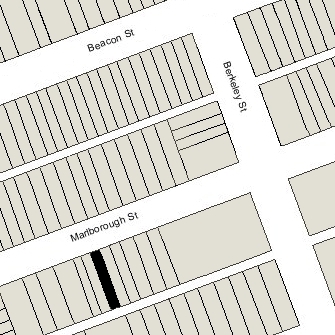 By 1878, the Greenoughs had moved to 16 West Cedar and 76 Marlborough was shown as vacant in the 1878 Blue Book. By the 1878-1879 winter season, it was the home of dry goods merchant Oscar Hallet Sampson and his wife, Ellen Constance (Sampson) Sampson. They previously had lived at 111 West Chester Park. The Sampsons continued to live at 76 Marlborough in 1883, but had moved to 193 Marlborough by the 1883-1884 winter season. By the 1883-1884 winter season, 76 Marlborough was the home of Dr. Robert Thaxter Edes and his wife, Anna C. (Richardson) Edes. They previously had lived at 71 Beacon. Robert Edes was a surgeon and professor at Harvard Medical School. They continued to live at 76 Marlborough until about 1886, when they moved to Washington DC. 76 Marlborough was not listed in the 1887 Blue Book. By 1888, 76 Marlborough was the home of Miss Sarah Alice Brown, who operated a school for young ladies at the house. From about 1890 through about 1892, Miss Hannah A. Adams lived with her. She was no longer listed there in the 1893 Blue Book. By 1892, Sarah Brown’s mother, Eliza Ann (Alexander) Brown, the widow of Edwin R. Brown, and Miss Amelia L. Owen, a teacher in the school, lived with her. They all continued to live there in 1894, but by 1895 had moved to 66 Marlborough. The club remained at 76 Marlborough in 1893, but had moved to rooms at the Bellevue at 23 Beacon by the 1893-1894 winter season. It incorporated as the College Club in May of 1895, and by the 1897-1890 season had moved to rooms at the Grundmann Studios building (Clarendon near St. James). It remained there until 1905, when it purchased and moved to 40 Commonwealth. 76 Marlborough was not listed in the 1895 Blue Book. On January 10, 1895, 76 Marlborough was purchased from Mary Clark by Gertrude (Flint) Townsend, the wife of Dr. Charles Wendell Townsend, a pediatrician. They previously had lived at 61 Chestnut. Dr. Joseph Payson Clark, a physician, lived with the Townsends and also maintained medical office there. He previously had lived at 385 Marlborough with his mother, Mary E. (Mulliken) Clark, the widow of Dr. Joseph James Clark. He continued to live and maintain his office at 76 Marlborough until about 1900, but by 1901 had moved both to an apartment at 409 Marlborough. In 1906, he purchased and moved to 71 Marlborough. In 1905, Gertrude Townsend’s sister, Sarah (Sarita) Gore Flint, was living with the Townsends. She was an artist and also Assistant in Charge of the Textile Collection at the Museum of Fine Arts. She continued to live with them in 1909, but had moved to 98 Pinckney by 1911. Gertrude Townsend died in June of 1917. Charles Townsend probably continued to live at 76 Marlborough until July of 1919, when he married Sarah Gore Flint. After their marriage, they lived at her home at 98 Pinckney, and he maintained his offices at 205 Beacon. On January 28, 1921, 76 Marlborough was purchased from Getrude Townsend’s heirs by attorney Lyon Weyburn and his wife, Ruth (Anthony) Weyburn. They previously had lived in an apartment at 405 Marlborough and, before that, at 285 Marlborough. They also maintained a home in Prides Crossing. In January of 1920, they applied for (and subsequently received) permission to remodel the interior of the house. The remodeling probably was undertaken soon after they purchased it and before they took up residence there. In 1933, they were joined at 76 Marlborough by Richard Lyon Bowditch and his wife, Mabel Lowell (Rantoul) Bowditch. They previously had lived at 8 West Hill Place. Richard Bowditch was a mining engineer and later would become chairman of the board of C. H. Sprague & Son Company, coal and oil producers. They also maintained a home in Fitzwilliam, New Hampshire. The Weyburns made their primary home in Prides Crossing but continued to list themselves at 76 Marlborough, along with the Bowditches, in the 1933-1936 Blue Books. The Bowditches continued to live at 76 Marlborough during the 1935-1936 winter season, but moved to Cambridge soon thereafter. On April 30, 1936, 76 Marlborough was acquired from Lyon and Ruth Weyburn by Richard A. A. Martin and his wife, Priscilla S. (Ball) Martin. They previously had lived in Athol. He was president of the Air-flo Company, dealers in air conditioning systems. They moved by 1938 (possibly to Sarasota, Florida, where they were living at the time of the 1940 US Census) but continued to own 76 Marlborough and lease it to others. In 1938, 76 Marlborough was the home of Harry Conner. He previously had lived in New Jersey. By 1939, 76 Marlborough was the home of Theodore Barnet Plimpton, founder and president of the New England Mica Company. He previously had lived in Brookline. His wife, Irene (Snow) Plimpton, was living separately in an apartment at 113 Commonwealth. By 1940, he had moved to 2 West Hill Place. By 1940, 76 Marlborough was the home of Doris (Petterson) Bradford, the widow of Dr.Walter A. Bradford, a dentist, and their four children: Robert, Richard, Deborah, and Susanne Bradford. They had moved by 1941. In 1941, 76 Marlborough was leased by Katharine Gibbs School. In September of 1941, the school applied for (and subsequently received) permission to convert the house from a single-family dwelling into a dormitory. Upon receiving the approval, it submitted a second application requesting that the use be modified to permit the former dining room and living room to be used for classrooms. The application was denied, the school appealed, and the Board of Appeal granted the use for a period of one year. By 1943, 76 Marlborough was the home of Fay Ernest Slingerland and his wife, Lois Bertha (Evans) Slingerland. They previously had lived in Washington DC. He was a photographer. Living with them were Chalmers Murray and his wife, Harriette Rebecca (Evans) Chalmers, who was Lois (Evans) Slingerland’s sister. They previously had lived in Florida. He was a photographer and also concert violinist. The Murrays moved to 123 Commonwealth by 1944. The Slingerlands purchased 76 Marlborough on October 9, 1944. They continued to live there in 1946, but moved soon thereafter back to Washington DC. On October 27, 1947, 76 Marlborough was purchased by Joseph J. Diab. He and his wife, Dorothy H. (Bancroft) Diab, lived at Brimmer Chambers at 112 Pinckney, where he was the building superintendent. His brother, Thomas J. Diab, was a real estate dealer and developer. On January 25, 1949, 76 Marlborough was purchased from Joseph Diab by William Byers and his wife, Iva Mae (Rowe) Byers, who operated it as a lodging house, although its official use remained as a dormitory. They continued to live there until about 1951, when they moved to Gloucester. On January 17, 1950, 76 Marlborough was acquired from the Byerses by Flora L. (Enright) O’Keefe, the widow of Philip T. O’Keefe. She lived at 72 Marlborough. 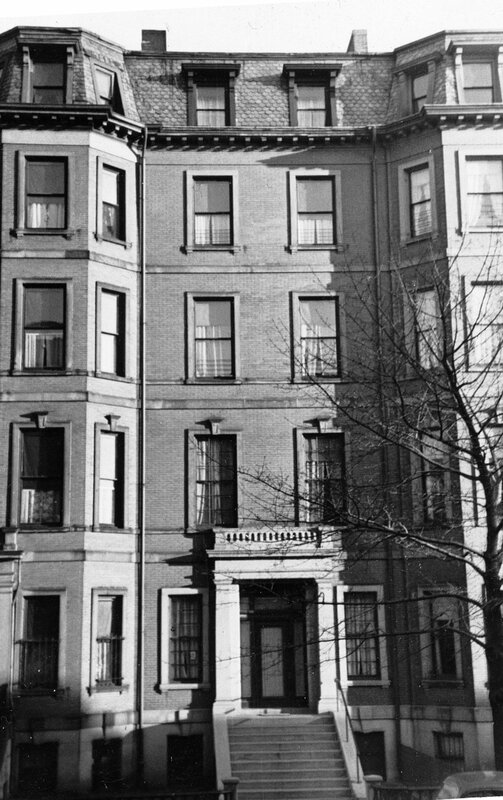 On March 28, 1950, 76 Marlborough was acquired from Flora O’Keefe by Mrs. Edna Mae (Reynolds) Candage Lovejoy Walsh Grant, who operated it as a lodging house. She was the former wife of Henry (Harry) Wells Candage, the widow of Everett John Lovejoy and Dr. William Martin Walsh, and the former wife of Wallace Edwin Grant. Edna Grant lived at 470 Beacon, where she also operated a lodging house. 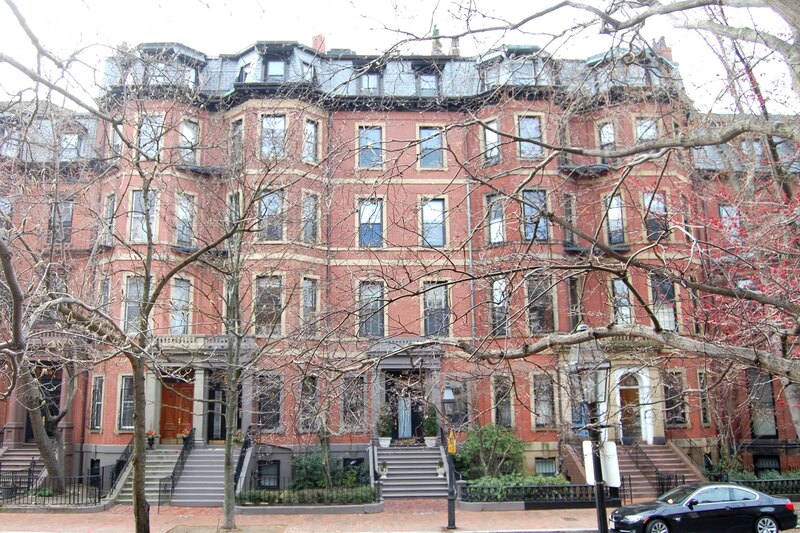 She also several owned other Back Bay properties. In about 1951, she moved to an apartment at 220 Commonwealth. On October 1, 1951, she was arrested and charged with arranging for illegal abortions, working with three physicians who also were arrested. On November 15, 1951, Edna Grant transferred 76 Marlborough and her other properties to a trust she established for her benefit with Anna Louise (Day) Hicks as trustee. On June 15, 1953, 76 Marlborough was purchased from Anna Louise (Day) Hicks by Frank E. Wentworth, a salesman, and his wife, Kathleen (Phippard) Wentworth. They previously had lived in Newburyport. They continued to operate it as a lodging house. On June 30, 1966, 76 Marlborough was purchased from the Wentworths by Louis Grolnic. On July 14, 1966, he transferred a half-interest in the property to Milton B. Popkin. Milton Popkin and Louis Grolnic also owned 74 Marlborough. Although 76 Marlborough had been operated as a lodging house for many years, its last approved use was as a dormitory, and after acquiring the building, Milton Popkin and Louis Grolnic proposed to operate it as such. The neighbors objected, indicating that the use was not permitted since the house had not been used as a dormitory for many years; the Building Department, however, affirmed that the official occupancy as a dormitory had not expired due to non-use. It appears, however, that the property subsequently was used as a lodging house and not as a dormitory. On December 28, 1972, 74 Marlborough and 76 Marlborough were acquired from Milton Popkin and Louis Grolnic by Robert L. Rusconi and Aldo Garda, trustees of the Garus Realty Trust. They continued to operate both properties as lodging houses. On February 10, 1983, the Four Twelve Realty Corporation (Arthur E. Simons, president; Ronald S. Luccio, treasurer) purchased 74 and 76 Marlborough from the Rusgar Nominee Trust, successors to the Garus Realty Trust. In March of 1983, Four Twelve Realty Corporation applied for (and subsequently received) permission to combine 74 and 76 Marlborough into one property, build a one-story, three-car garage at the rear, and convert the combined property into eleven apartments. 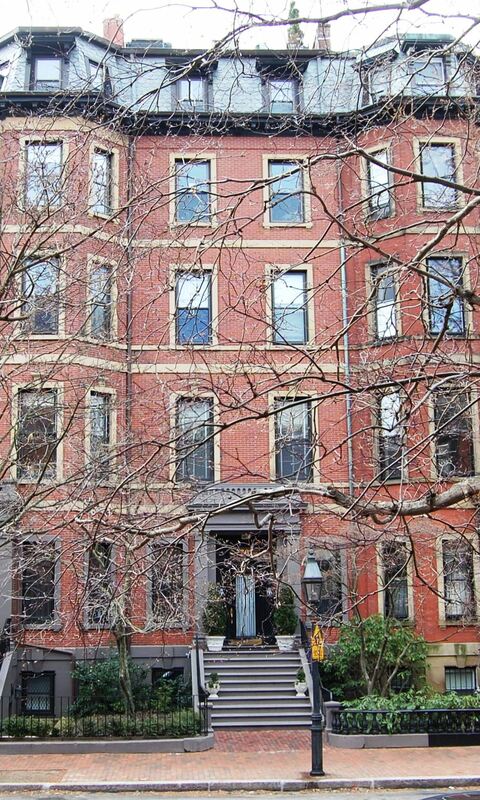 On August 12, 1983, it converted the property into eleven condominium units, the 74-76 Marlborough Street Condominium.